Being a woman, a twenty-first century medicine student, wearing trousers with a zip and having its own criteria is probably not the best camouflage to go unnoticed in the university society of Victor Frankenstein era. As if it were Alice falling through the hole, a nowadays young woman travels to the end of 18th century, and becomes involved in the social context of Mary Shelley’s Frankenstein or the modern Prometheus, the major work of gothic literature and pioneer of science-fiction gender par excellence. Norah, the main character, will have to disguise herself as a young man and also as a young lady, to fit in the clothes and customs of that time and to be able to help her friend Max to solve the problem with the creature that Max’s irresponsible friend, Victor Frankenstein, has created and abandoned in the lab. 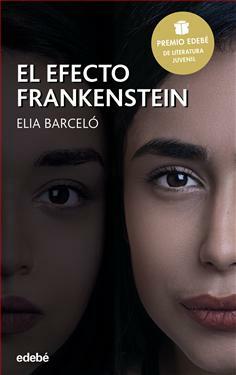 The Frankenstein effect opens a dialog among two eras and leads us to think about gender, social and professional equity. And, as the original Shelley work, it puts emphasis on the obligation to accept our responsibilities and the consequences of our acts. “He opened his eyes to a gloom where a bright orange light crossing a half-open blind painted streaks on the wall. He did know where he was, and for awhile he feel scared, like drowning, because he did not recognize the roof ceiling or anything around him. He closed his eyes again. Sometimes it happens, and then after a few seconds everything is again in place and clear. He opened his eyes again, slowly, giving his brain the opportunity to start up, and offer him the answer he needed. Nothing. He still did not know where he was and why he had woken up there at nightfall. Had he drunk too much the night before and some friend had offered him to stay at his house?.